Devcon is the annual conference run by the Ethereum Foundation. It is designed to consolidate all of the research efforts from the previous 12 months and explain them in a cohesive manner. Normally, Ethereum research is scattered across many different platforms and is not particularly easy to follow. It can be a bit overwhelming to stay up to date with announcements on gitter, reddit, telegram, twitter and discord. Devcon, however, serves as a central hub for those who want to be apprised of recent developments, but lack the necessary time to scavenge for updates. 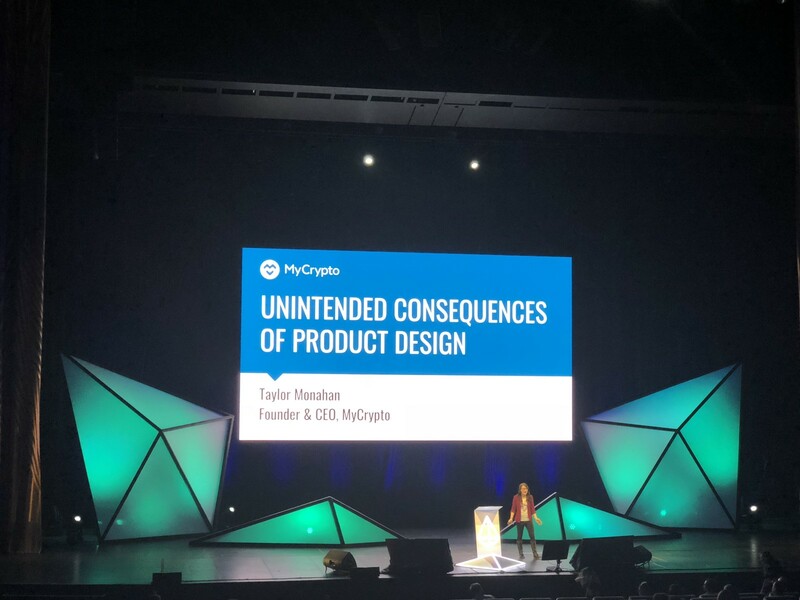 This year was no exception, as thousands of developers and users came together to discuss new findings and thoughts on the crypto space. The overwhelming focus this year was the continued development efforts on scalability and dApp development. Ethereum founder Vitalik Buterin gave yet another reassuring keynote, something he is known for by now. In this case, he chose to give some context on the recent delays of Casper and sharding, Ethereum’s new consensus algorithm and scalability solution. Simply put, there are numerous challenges when it comes to building truly decentralized networks. For starters, the variant of Proof of Stake they are implementing has never been attempted before. Similarly, sharding is an incredibly complex endeavor and requires a complete re-architecture of the entire Ethereum protocol. Even though the last 3 years did have some unfortunate dead ends, they were able to iterate based on their findings. Fortunately, Vitalik now claims they’ve passed a turning point. The bulk of the remaining work is on implementation rather than unsolved problems. Sometime in late 2019 or early 2020 I believe we can expect a mainnet launch. In addition to Casper/Sharding (now jointly called Serenity), there were a plethora of updates elsewhere. Metamask, the most popular Ethereum wallet, announced a mobile app. PegaSys, a ConsenSys spoke, launched its Java client geared towards enterprise users. Adoption was a huge focus this year, as teams are beginning to explore new techniques for onboarding users. For example, meta transactions allow users to interact with apps without having to pay fees. I also played around with a Proof-of-Authority sidechain for the stablecoin Dai. The PoA chain has high scalability and allows fees to be paid in Dai instead of Eth. Maker, Augur, and 0x all gave talks where they recapped their recent progress. In the past year, Maker has undergone a successful beta for Dai. Augur finally hit mainnet and has operated without any major issues. 0x has also seen a significant upgrade with its ability to process non-fungible tokens. All 3 projects are now slowly beginning to transition their efforts from underlying infrastructure towards user experience. For maybe the first time ever, the Ethereum platform is starting to feel synergistic. Dapps leverage each other and make use of scalability solutions. Teams actively talk to each other and collaborate. Things appear to be slowly coming together. Devcon was massive. Not only in the number of people (3000+), but also the amount of content to consume. From scalability and privacy to UX and governance, the Ethereum Foundation brought in a lot of experts in the space. But what really struck me was the amount of non-Ethereum talks given. The technical diversity was impressive and representative of the bridges the Ethereum Foundation has built with other teams. Ethereum researcher Justin Drake gave a wonderful talk on Verifiable Delay Functions (an improved way of injecting a random number generator into a blockchain) and announced a joint partnership with Filecoin to fund needed hardware research. The Zcash team had several speaking slots regarding SNARKs on Ethereum, another avenue towards improved scalability. It’s becoming clear that the Ethereum community is a collaborative effort across many different cryptocurrencies. Non-crypto projects also had a strong presence. Cory Doctorow from the Electronic Frontier Foundation gave my favorite talk of the conference on the history of Internet security. He outlined a lot of the legal fights he’s been involved with in trying to fight for users’ rights. He also gave great insight on how it is necessary for the community to be on good terms with government/institutions. In his view, complete privacy and security is difficult to achieve without the coordination efforts of everyone involved. Instead of trying to safeguard our privacy in a manner where even one slip up could compromise us, we should fight via the legal system. If we’re successful in reducing government power, then we can live our lives without having to look over our shoulders 24/7. Devcon was an extremely well-run conference, and I was constantly amazed by the quality of the content and people. What I experienced last week was the Ethereum vision I signed up for: a collaborative effort to push forward individual freedoms in a focused yet decentralized fashion. I’m pretty excited for the future if we can continue going down this path. Thanks to Jordan Clifford and Linda Xie.